Police and bailiffs cleared an anti-capitalist camp from outside St Paul’s cathedral in London early on Tuesday, ending a four-month protest which resonated with Britons angered by huge bonuses awarded to bankers during an economic slowdown. The Occupy London camp outside St Paul’s Cathedral being cleared on Tuesday. At least two law enforcement officers were injured on Monday during a clash with members of the Occupy movement who were at the State Capitol to counter a rally by a group protesting violence by blacks against whites in South Africa. Certain officials in the ISI and Pakistani military, including a retired General, knew the arrangements for Osama bin Laden and his Abbottabad-safe house, claims a leaked email of Stratfor, the US-based global private intelligence firm. Militants clad in military uniforms intercepted a convoy of buses and gunned down 18 minority Shia men today in a northern Pakistan region that borders the former Taliban stronghold of Swat. At least 13 persons were killed and 43 others injured when a huge explosion ripped through a chemical plant in northern China today, officials said. The accident at Hebei Keeperchemical Industries Co Ltd in Zhaoxian County in Hebei province flattened one of the factory’s workshops and broke window panes within a radius of two kilometres, local officials said. The injured had been hospitalised. Mahatma Gandhi has been baptised in proxy by a US church, drawing sharp reaction from his grandson and others. Gandhi was baptised by the Church of Jesus Christ of Latter-day Saints (LDS), headquartered in Salt Lake City in Utah on March 27, 1996; the confirmation of which was completed on November 17, 2007 at Sao Paulo Brazil Temple, according to researcher Helen Radkey. Pakistan's Supreme Court on Tuesday summoned Cabinet Secretary Nargis Sethi as a witness in contempt proceedings against Prime Minister Yousuf Raza Gilani and adjourned the high-profile case till March 7. A seven-judge SC bench, headed by Justice Nasirul Mulk, was hearing the case. There was no violent resistance from the Occupy London activists as bailiffs employed by the City of London Corporation, which owns the land on which they were camped, removed around 50 tents within an hour shortly after midnight. The urban camp was set up as part of an international movement inspired by the US Occupy Wall Street against what the activists say is corporate greed and economic inequality. It was one of many protests across Europe in recent months as the continent struggles with a debt crisis. Authorities in some North American cities have used violence to forcibly remove similar camps but in London the action was largely peaceful. The protesters themselves had removed around 100 tents after they lost their legal battle to stay last week. 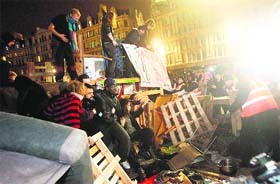 After dismantling the remaining tents, bailiffs took down a barricade of wooden crates where about a dozen activists had stood, chanting “Occupy Everywhere”. Police shunted others across the cathedral steps. The protesters chose to pitch their tents outside St Paul’s in October after they were blocked from their intended target, the nearby square at the London Stock Exchange. The 300-year-old baroque cathedral is one of central London’s most recognisable landmarks, a favourite with tourists and likely to be thronged by Olympic visitors this summer. It was also where Prince Charles married Princess Diana in 1981. The clash erupted as California Highway Patrol and police officers were escorting about 35 members of the South Africa Project to a parking garage following their protest. About 50 members of Occupy Oakland began throwing cans and bottles, then rushed the officers. Two officers suffered minor injuries and were taken to a hospital. CHP Capt. Andy Menard said one officer who was struck in the face by an object was released from the hospital. The second officer was getting X-rays after apprehending a person suspected of throwing objects, Capt. Menard said. “Mid to senior-level ISI and Pak military with one retired Pak Military General that had knowledge of the OBL (Osama bin laden) arrangements and safe house,” wrote Fred Burton, Stratfor’s vice-president for intelligence in an email, leaked by WikiLeaks, to one of his company’s regional director for South Asia soon after the killing of the Al-Qaida chief by the US commandos in a daring operation on May 2 last year in Abbottabad. Burton, who is considered one of the world’s foremost experts on security, terrorists and terrorist organisations, however, did not reveal his source of such an information, but did say that it was coming from his source in Pakistan. Less than a dozen people within ISI and Pakistan military had information on bin Laden, he writes in the leaked email. In the leaked email, Burton informs Kamran Bokhari, Stratfor’s regional director for the Middle East and South Asia that the source, however, did not provide him with the names of ISI and Pakistan military officials who had knowledge of this arrangement for Osama bin Laden. At the same time, he asserted that the American intelligence knew about it. “Names unk (unknown) to me and not provided. Specific ranks unk to me and not provided. But, I get a very clear sense we (US intel) know names and ranks,” Burton wrote in his email dated May 13 using his Blackberry. Eight others were injured in the attack, for which the banned Jundullah group has claimed responsibility. Two women and three children were among the injured, officials said. About 10 to 15 gunmen stopped three buses near Harban village in Kohistan district of Khyber-Pakhtunkhwa province, about 200 km from Islamabad, and shot the Shias after ascertaining their identity. 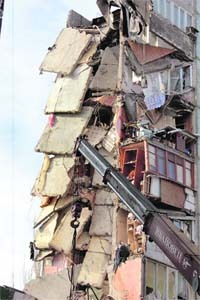 A view of an apartment building after an explosion in Astrakhan. The Church of Jesus Christ of Latter-day Saints (LDS) is more popularly known as Mormon Church, one of the fastest growing churches in the US. Radkey, who has now been excommunicated by the Mormons, made the revelation in an e-mail to Nevada-based Hindu activist, Rajan Zed. Gilani’s counsel Aitzaz Ahsan briefly referred to the various arguments he has listed in the appeal and said he wanted to present evidence and produce witnesses. He requested the court to allow him adequate opportunity to further examine the case.